How can we better understand how content circulates within contemporary networked culture? The collective decisions people make about whether to pass along content are profoundly reshaping the media landscape. Many content creators struggle with the growing prominence of grassroots audience practices, while an array of online communication tools have arisen to facilitate informal, instantaneous sharing. This environment offers new opportunities for people to pass along content and new models to generate revenue from user activities. While the means for people to circulate material have proliferated, recommending and sharing are impulses that have long driven how people interact around media texts. In this session, the authors of the new book Spreadable Media discuss core concepts from their work, focusing on the social logics and cultural practices that have enabled and popularized these new platforms, explaining why (not just how) sharing has become common practice. Henry Jenkins is Provost’s Professor of Communication, Journalism, Cinematic Arts, and Education at the University of Southern California. He is co-author, with Sam Ford and Joshua Green, of the 2013 book Spreadable Media: Creating Value and Meaning in a Networked Culture. He is also author of Convergence Culture (2006), Fans, Bloggers, and Gamers (2006), The Wow Climax (2006), Textual Poachers (1992), and What Made Pistachio Nuts? (1992); co-author of Confronting the Challenges of Participatory Culture (2009); editor of The Children’s Culture Reader (1998); and co-editor of Rethinking Media Change (2004), Democracy and New Media (2003), Hop on Pop (2003), From Barbie to Mortal Kombat (2000), and Classical Hollywood Comedy (1994). From 1993-2009, he was the MIT Peter de Florez Professor of Humanities and co-directed MIT’s Comparative Media Studies graduate degree program. Since coming to USC, Jenkins has formed the Participatory Culture and Learning Lab which includes Project New Media Literacies and Media Activism and Participatory Politics. He holds a Ph.D. in communication arts from the University of Wisconsin, Madison, and a Master’s degree in communication studies from the University of Iowa. Joshua Green is a Senior Strategist at Undercurrent. With a PhD in Media Studies, he has managed research projects at MIT and the University of California. He wrote the first in-depth book about YouTube, and is co-author (with Henry Jenkins and Sam Ford) of Spreadable Media: Creating Value and Meaning in a Networked Culture (2013, NYU Press) about how content spreads through participatory culture. Josh is a fan of home cooking and mass transit. Sam Ford is Director of Digital Strategy with Peppercomm Strategic Communications, an affiliate with both the Program in Comparative Media Studies at MIT and the Popular Culture Studies Program at Western Kentucky University, and a contributor to Fast Company. 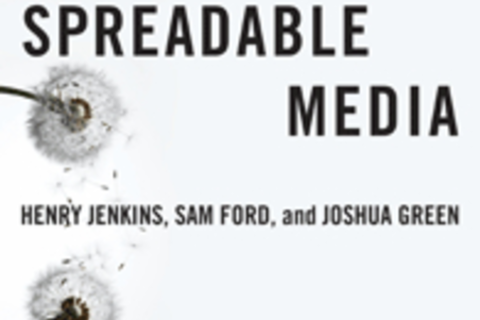 He is also co-author of the forthcoming Spreadable Media: Creating Value and Meaning in a Networked Culture with Henry Jenkins and Joshua Green with New York University Press. He is also co-editor of the 2011 book The Survival of Soap Opera: Transformations for a New Media Era with Abigail De Kosnik and C. Lee Harrington. Sam was named the 2011 Social Media Innovator of the Year by Bulldog Reporter and serves on the Word of Mouth Marketing Association's Membership Ethics Advisory Panel. He also manages the Futures of Entertainment Fellows network and organizes their annual conference at MIT. Sam has written for BusinessWeek, The Huffington Post, Portfolio, Chief Marketer, The Public Relations Strategist, PR News, Bulldog Reporter, The Christian Science Monitor, and a range of other publications and blogs. His has also been quoted or had his work featured by Investor's Business Daily, New York Times Magazine, The Financial Times, CNN, NPR, BBC Worldwide, The Australian Broadcasting Corporation, Télérama,The Boston Globe, Boing Boing, Slashdot, Mashable, ESPN: The Magazine, Reader's Digest, Soap Opera Weekly, PRWeek, The Firm Voice, and other publications. He has spoken at South by Southwest Interactive, The Word of Mouth Marketing Association's School of WOM, the Futures of Entertainment conference and the annual conferences of The Society of Cinema and Media Studies and the Popular Culture Association, among others. He is also on the editorial board of Transformative Works and Cultures. Sam holds a Master's degree from the Program in Comparative Media Studies at MIT and a Bachelor's degree from Western Kentucky University, where he majored in news/editorial journalism, mass communication, communication studies, and English. He is a Kentucky Press Association award-winning journalist and has performed in a variety of local professional wrestling events. He lives in Bowling Green, Kentucky. He can be reached at sford@peppercom.com and found on Twitter @Sam_Ford.